Why the secretive sudden rush to pass this bill when public did not have a chance to have more dialogue on it? Well, the continuation status quo of taking our nation into an incremental Dictatorship for pretty much our current administration can now even declare our backyards a battle field not to mention that in a twist and turn of “legalize” has used an incident of killing an Arab type of U.S citizen that was abroad. It sounds harmless to go after such a person that was claimed to have done something wrong but to act like death squads and bringing this same power home even to our yards (statement quoted by McCain’s buddy Lindsey Graham) is extremely disturbing. Trust me if an American saw an Al Quaida he or she would use their 2nd Amendment rights and if not a housewife would chase down the street with a broom or mop if necessary. This is something more than what is being presented like the total errosion and destruction of what is America and all that it stands for transforming our society into something dark and sinister. This is also both sides Democrat and Republican constantly bypassing the will of the people and allowing our the nation to be looted, transformed, used, and entangled with foreign government via the bailouts for a lot of funds according to Bernanke did go to undisclosed Europen banks in the first round (found on Google) but now we still are facing giving them even more money to bail-out the EU monetary dysfuntion which they were trying to give us with a back-door North American Union and we would have been facing the same fate as European Union (EU) going down with Mexico and Canada perhaps if many voters and concerned citizens of the time would had not oppose it. Notifications sent to public by several concerned groups:-“The Senate is going to vote on whether Congress will give this president—and every future president — the power to order the military to pick up and imprison without charge or trial civilians anywhere in the world. (This was to get us merging with EU that has corpus juris and no habeaus corpus in which body of evidence must be presented before anyone can imprison you, note we are not supposed to be a monarchy nor have despots Kings). The power is so broad that even U.S. citizens could be swept up by the military and the military could be used far from any battlefield, even within the United States itself,” writes Chris Anders of the ACLU Washington Legislative Office. -The bill was drafted in secret by Senators Carl Levin (D-Mich.) and John McCain (R-Ariz.), before being passed in a closed-door committee meeting without any kind of hearing. The language appears in sections 1031 and 1032 of the NDAA bill. –This means Americans could be declared domestic terrorists and thrown in a military brig with no recourse whatsoever. Given that the Department of Homeland Security has characterized behavior such as buying gold, owning guns, using a watch or binoculars, donating to charity, using the telephone or email to find information, using cash, and all manner of mundane behaviors as potential indicators of domestic terrorism, such a provision would be wide open to abuse.-If you thought that the executive assassination of American citizens abroad was bad enough, now similar powers will be extended to the “homeland,” in other words, your town, your community, your back yard. Another thing, America was never a country that took onerous religious positions which seem to be becoming predominat making its way into our voting system and precincts. Barry Goldwater had advised for the U.S. to not allow religious persecution type of behavior to become part of our culture; especially the reason we left Europe to start a new country with Liberties and ways of expression. Today more and more religious extreme stances type of behavior like outcasting or creating division to other leaders who DO NOT take onerous religious views;especially since that is not good for America for it has liberty of religion and voters will be from different denominations who often do not share the view that onerous Religion stances justify war or compromising the entire form of government of the U.S> for only one religion. Under our Constitution everyone person is a sovereign with Inalienable rights and his entire humanity is respected under our creator of the Universe. One must think more clearly for WAR is not always the right answer since this turmoil could cause more harm than good like leading us into a World Dictatorship centralized so much that it could be a million times worse than what is currently the situation at hand. 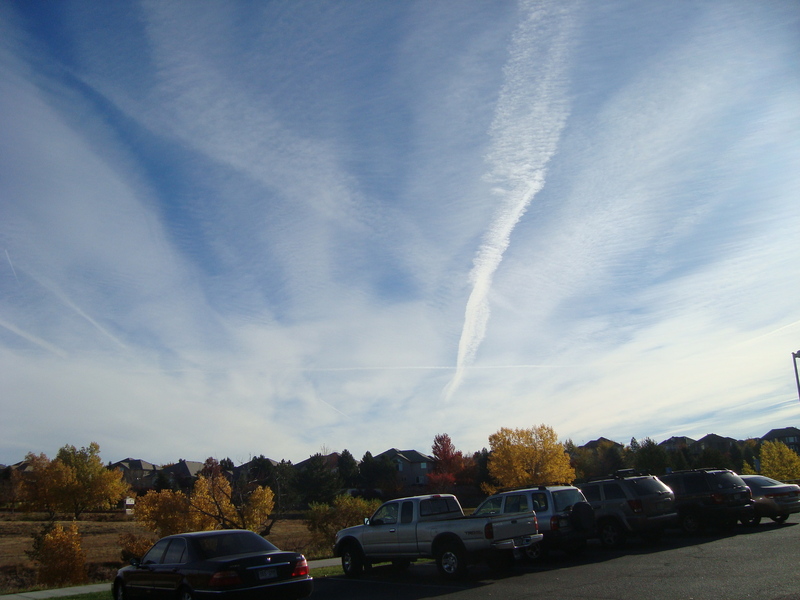 With no rights under a U.N. ran central Army we could all be sitting ducks when they even Justify spraying quemicals from the sky as if all of humanity are pesty insects. How is it that a Nation that claims to do war for X and Y reason disregards its citizens by taking away rights under the Constitution, right to supplements Vitamins (readying us for global entanglement for Codex Alimentarius), allows Monsanto to damage our livers and even name top CEO the Food Czar for the United States?, has Darpa experimenting by releasing Smart Dust (getting us ready for Nanotechnology halfman/half micro products metallic like aluminum into our blood stream with newcomer GOP Newt Gingrish heavily invested in this project even chaired one?, now the S. 1867 Lets get opposers out of their homes and into camps?, how about the insider trading Privilege that often does not support voters wellness with Health Care Bill becoming a new comodity and on and on, on etc, so many bad wacky crazy anti-American society, culture, Constitution Bills legislations being passed that it is outrageous and has to Stop. I am glad I am not male for not sure what patience could be left for frankly cannot see how American males are allowing their women and children to be abused. Why is Wyeth taking away vitamin B6 from the market so soldiers mothers go earlier into a menopause to then have to buy their expensive pharma? Under the U.N. humans are seen by Utility concept so we could be possibly harvested for disease and profit to benefit the system if deemed necessary. ?? Is this the way a Nation that wishes to go to war even confront China in Australia adding more steam to the madness; looking after the men, women, wives and children of those who have to go and fight the WARS? I do not buy the arguments for it they really wanted a strong fighting force at least have the Decency of NOT insulting their intelligence nor think that their humanity is less than any other global player by disregarding their right to their homeland’s U.S.A. water, food, air, housing, monetary system stability and yes jobs left here for their families so when they come home they can at least have some comfort of finding some peace of mind. More on S.1867 The National War Authorization Act Bill since years ago Defense Dept was called The War Department but how convenient to twist the keyword around for the people now may be the ones to need defense from so much insanity placed upon them as of late. (Image, 2011, Daneen Peterson of Stop NAU.com). 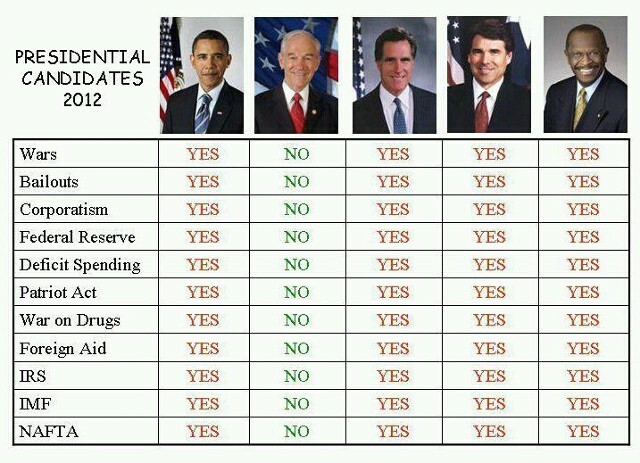 It seems that most candidates are serving the same special interests and as of late there is less difference on the issues among them except for Dr. Ron Paul and yes of course he is being totally blacked out of the media (so much for us being a true Democratic Republic, people in foreign lands perhaps have more democracy than us) and the only one not following the same path to more wars, globalization (centralization of power) and banking power grab from the people and the private sector. on Public Law 101-216 More here, Public Law 101-216 (87-287 Freedom from War so banks owne it all). Newt Gingrich-the Grench that stole American’s Christmas plus Nation and economy to Internationalist Globalists is more likely. This document was written after WWII by bankers and special interests which many orquestrated these wars in the first place (Search Professor Anthony Sutton) then to come up with an excuse for World Disarmament so all Assets go to them the centralization of Power Grabbers as its happening now with their next World banking Collapse Orquestration. Unfortunately, this is the reality of the matter. With interational banks at the center and various multinational companies in the periphery, the network continues to dominate and control the course of world events. The citizens of the respective countries are little more than objects to be taxed and manipulated. (The August review, 2011). So, under this so called future Dictatorship type of “Human Global Management” (yes, this is a United Nations, UN wacky document in which humans are no different than insects and the implications thereof), everyone will suffer the Jews, Whites, Blacks, Asians, Puerto Ricans, Russians, South Americans etc., for they are tweaking with their FRANKEN SCIENCE the planet earth like sociopaths. Proof: Scientist concerned are researching for more BlueNOMore and Coalition Against Geo-engineering. Well, why bother taking so much out of my time, losing income and ability to spend time with family? Well, what good is it when all that we work so hard for is at severe RISK? Under the Kyoto accord and now the new being tested kyoto card (Smart Grid future money replacement) we all become sitting ducks to bureaucrats who believe themselves above sovereign citizens and they are taking away our food supply integrity, land, water, health care, Nation, children and gambling with the entire econo-system since proof also surfaces that they are tweaking natural world biology (Creators Natural Order of the Universe) and using Nanotechnology, harmful radiofrequency with the Smart Meters, Genome alterations, Insects bio-engineered, GMO’s that harm our liver and that of our children, massive controversial global vaccination programs that also pose altering via DNA-viral added ingredients etc. etc, the list goes on…and watch out for Smart dust now landing in some of our yards… (Newt discussed on a video for had knowledge on some of these bio-engineering programs at a hearing held). It will surface later as nation keeps deteriorating. 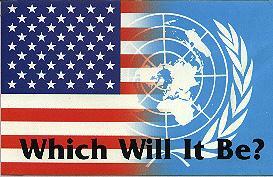 About Public-Law 87-297 which takes away from our Second Amendment rights-and places us under a future United Nations total control-Read this research e-mail and visit Libertygunrights.com for more on subject. Pub. L. 87-297 entitled Arms Control and Disarmament Act exists today; in fact, it has been amended several times and is codified in Title 22 of the United States Code, beginning with section 2551. If you would like to see the law as amended, you can use the United States Code . From the home page, click on Search the U. S. Code. On the following page, insert 22 in the space for Title, 2551 in the space for section, and click Search. On the following page will be a link 22 USC sec. 2551; click on it. The text of the codified law will be on the next page. To move from section to section, click on the arrows at the top and/or bottom of the page. If you would like to see a list of public laws that made up the code section, go to the set of parentheses labelled Source at the end of the Code section. You will see that some sections of the Act were amended as recently as the 107th Congress (2001/2002). Although the law remains in force, the agency was abolished and reorganized under the Secretary of State. Hopefully, this information is helpful. Is public law 87-297 , The General and Complete Disarmament Law still in effect and is it real???? timely closure and realignment of military installations inside the United States.” Click here, BRAC.gov; only to further their centralization world hemogeny since they are NOT concerned about our well-being but that of the banks (league of nations creators later called the UN and special interests) that allowed so many to include Camp Le Jeune have POISON water (hurting tons of Marine families killing many of their offspring) and at Fort Polk while I was walking my dogs a chlorine valve exploded that HURT me burning my skin but it affected me and my ability to get employment etc, and care for my two kids. Even today some interference in my ability to conduct my business pursuits have occured but I will continue to be successful and plan on making the Department of the Army compensate me and responsible for their lack of informed consent and cover up while I tried to get medical care; answers etc. and with their pet projects at Polk risking injury later covering up so as not to compensate. These people are COWARDS (globalists profiteers planners) and Do NOT care who Lives Nor DIES. Take it from me since I know by experience suffering at the yoke of their Madness and self-interests and profiteering. We need to protect our right to bear arms and protect ourselves; especially in the event that more poisons are unleashed to the general population. Education is mightier than force so no excuse for deliberate death is killing whether overtly, covertly or in plain sight;especially if for forming a global government behind the scenes that has no respect for the individual life or planet biology right to have its natural integrity and not altered for no scientist is God nor creator of the natural order of the Universe. Enough said, take action to save your local community before its too late to reverse the process. The madness against our Nation and our people has to end.